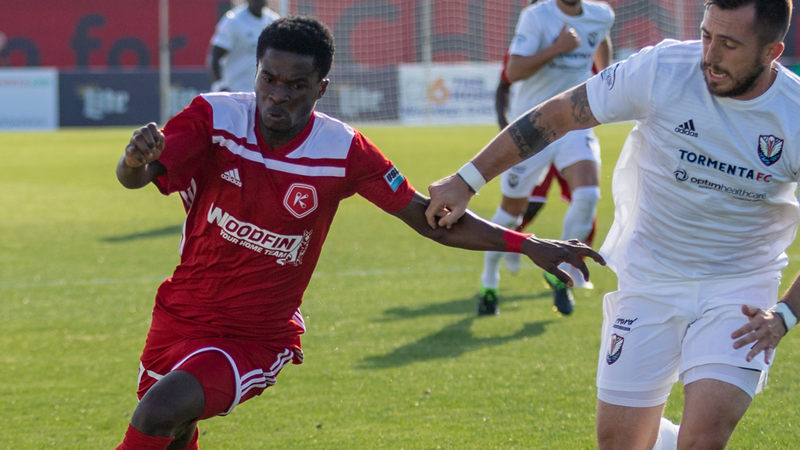 RICHMOND, Va. — (Saturday, April 6, 2019) — The Richmond Kickers (0-1-1) picked up their first clean sheet of the season, battling to a scoreless draw with South Georgia Tormenta FC (2-0-1) Saturday night at City Stadium. The Kickers had a chance in the sixth minute to try and get on the scoresheet through the Captain, Maxi Rodriguez. Matt Bolduc was able to get into the Tormenta box on the left side. Unable to get a cross in, Bolduc played the ball to hist left for Rodriguez in space. With time, Rodriguez curled in a cross towards the back post, nearly connecting with Ivan Magalhães making a run. Matt Bolduc had an opportunity in the 15th minute to go for the opener. Charles Boateng broke up an attempted clearance by Tormenta and quickly got the ball just behind him to Daniel Jackson. Jackson fed the ball through to Bolduc cutting inside, as he chipped his shot over the goal. A pair of chances came for Charles Boateng in the 22nd minute. Wahab Ackwei from the Richmond end of the field found Boateng making a run up the right side and played the ball over the top. Boateng was able to get on the ball with pressure from both Ricardo Gomez and Lars Eckenrode, he launched a shot across the face of goal and just wide. After the ensuing goal kick, the Kickers quickly picked up possession and Rodriguez played the ball through for Boateng making a run up the left side. This time Boateng sent his shot high. Wahab Ackwei had a sent his header wide at the back post in the 31st minute. The Kickers won a free kick on the right side, just inside the Tormenta end of the field. Scott Thomsen sent the ball over the top, connecting with Ackwei. He did not get the touch he wanted on his header and sent his shot just wide. Akira Fitzgerald saw his first real action in the 50th minute. Marco Micaletto picked up possession in the center circle as Amass Amankona went down with an injury. He found some space up the left flank and went for a shot on target at the top of the Kickers box, forcing Fitzgerald to make the save to his left. A run up the right side nearly ended with a goal from Eli Lockaby in the 56th minute. A quick give-and-go with Joe Gallardo helped Lockaby get in behind the Tormenta back line. Lockaby looked to sneak the ball in the near post, only getting denied from the Tormenta keeper Pablo Jara. Akira Fitzgerald picked up his and the club’s first shutout of the season behind three saves for the veteran keeper.